The Edward L. Hutton Research Library houses countless Lawrence County history and genealogy books and folders with information dating back as far as 1818. The 2100 sq ft room with wall to wall book cases and file cabinets also contains history and genealogy information from other counties and some other states. Other sources of information available in the library include an extensive map collection, Lawrence County school year books, photograph collections, and a microfilm room with microfilm of Bedford and Mitchell newspapers dating back to the 1830s. 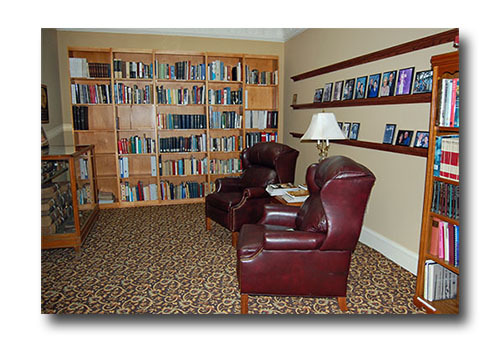 The Larry King Reading Room provides a quiet area to rest in comfortable chairs while looking over your selections. This room also houses many books on Indiana history and other areas of history. A glass case houses donated family Bibles with genealogy information inside. To protect these fragile books, this information has been copied and copies are available for your research. Cases and files are clearly labeled, but if the amount of information becomes overwhelming a volunteer or the librarian can assist you. Videos are available in the Library for viewing in the Reading Room. For availability and subject index, please check with an attendant in the Library.